SNES Daffy Duck: The Marvin Missions (USA) in 12:56.5 by Gunty. Daffy Duck is at it again. In this game, he plays Duck Dodgers, a futuristic space "hero" who sets out to stop an invasion force by Marvin the Martian. 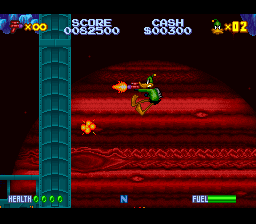 In this run, Gunty uses this game's interesting recoil and jet pack physics to fly through each of the stages at a very fast pace. If you want to see Duck Dodgers defeat Marvin in no time flat, see our run of the SGB version.